A few Weeks ago Nicole and I went to Tastings Wine Bar & Bistro to indulge in Chef Maues new winter menu and enjoy some r&r without the kids.We enjoyed some great food and drink and it was nice to be back at the old stomping ground once again only this time with my long time right hand man at the helm of his own kitchen. 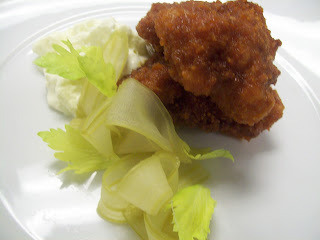 One dish Maue made was his version of Buffalo Chicken, only his was buffalo chicken livers...which were so good that I came back to the kitchen and told my crew we needed to have something buffalo style on the menu we were currently developing for 606 Congress, the hotels restaurant. Only challenge in my opinion was to refine the dish to fit our modern farm cuisine vision, without losing any of the fun of eating Buffalo chicken wings. We made a pretty standard pickling liquid without sugar and shaved the celery ribs before putting them in the bag with cold pickling liquid. We then vacuum sealed on high pressure allowing the pickle to penetrate without losing any of the crunch. The veal sweetbreads were poached and pressed then allowed to soak in buttermilk before being dredged in seasoned flour, Ive found that letting the flour sit on the sweetbread for 10 minutes or so before the second coating allows for a crisper end product. We used a Louisiana style hot sauce blended with butter, garlic, brown sugar and anchovy paste for our take on buffalo sauce. Overall just a really fun dish to make and a dish that the whole kitchen crew will be making sure to drop an "extra" piece of! Come on down and cheer me on, eat some American Lamb and drink beer....how can you say no?